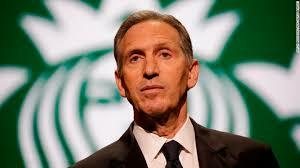 Howard Schultz, the former CEO of Starbucks, recently announced in a 60 Minutes interview that he is “seriously considering” running for president as an independent in 2020. While we should hope that the field of candidates running against Donald Trump is large, diverse, and talented, we don’t need another businessman with zero political experience to run for president. Even more importantly, Schultz’s decision to run for president will only increase the chance that Trump wins a second term. Polling by Schultz’s own campaign shows that he would win less than a fifth of the popular vote in a three-way race, and Trump would win the election. The fact that Schultz’s own polling shows him doing so badly may be because the electoral college system makes it extremely hard for independents to do well in presidential elections. Except for Nebraska and Maine, states award all of their electoral college votes to the candidate who wins the popular vote in that state. This means that Schultz would have to win the popular vote in several states to even just prevent any candidate from gaining a majority of electoral votes. Given how reliably people tend to vote with their parties, it’s highly unlikely that he would win a significant percentage of the popular vote in any state, so Schultz may not win any electoral votes. Even very few self-described independents are swing voters. History is a good indicator of how difficult an independent bid for president is— according to the Washington Post, only four minor party candidates have won more than 10 percent of the popular vote in the past 150 years. There’s no chance Schultz could win the presidency, but he could certainly affect the outcome of the election, which is why his candidacy is so dangerous. He’s already positioned himself as a centrist alternative to the Democratic nominee for voters who don’t want Trump to be reelected. He’s admitted that his strategy is to replace the Democratic nominee as the preferred candidate for anti-Trump voters. The consequence of this strategy is that he has spent much of the time since announcing his presidential bid attacking Democrats. He called Medicare for All, a government-run health insurance plan, “not American,” and other progressive policies “ridiculous” during interviews with “CBS This Morning” and NPR’s “Morning Edition.” If Schultz spends enough time criticizing Democratic candidates and policies, he could splinter off enough votes to allow Trump to be reelected. This could create a division in the Democratic Party between liberal voters and more centrist voters who would be more likely to support Schultz. Schultz says that the Democratic Party has shifted left to the point that it no longer represents his views, and that a liberal Democratic nominee couldn’t win against Trump. He claims that he is more electable and can run as a consensus candidate. This view doesn’t make sense, as progressive policies , such as higher marginal tax rates on the wealthy, are quite popular. Additionally, Schultz’s criticism of progressive policies such as Medicare for All and higher marginal tax rates on the wealthy as “ridiculous” creates a false dichotomy between the Democratic and Republican platforms. In a “60 Minutes” interview, Shultz characterized the two parties as “extremes on both sides.” If he portrays the Democratic platform as extreme, as he’s been doing, people may begin to see the two parties as equally extreme. In reality, the Republican platform is extreme and endorses hateful policies, while the policies proposed by Democratic presidential candidates so far are progressive, bold, and grounded. It would be very dangerous for voters to see the two parties’ policies in the same way. There’s simply no comparison between the party of family separation at the border and the party of Medicare for All. Overall, we should hope that a large field of candidates runs in the Democratic primary so that the strongest possible candidate can run in the general election and deny Trump a second term. This does not, however, extend to independent candidates like Shultz who would fracture the Democratic Party and potentially siphon off votes. Every 2020 presidential candidate’s primary responsibility is to do everything in their power to ensure that Trump does not win a second term. Schultz has said that “no one wants to remove … President Trump more than me.” If this is true, he needs to recognize how his candidacy could help Trump and decide not to run.